See also Candid Camera Corp. of America, maker of the Perfex. Candid Camera Supply Co. was an American distributor based in New York in the late 1930s. It notably sold the Minifoto Junior, name variant of the Falcon Miniature made by Utility Mfg. Co.
At the same time, the company also imported the Olympic cameras made by Asahi Kōgaku Kōgyō, which were the sole Japanese cameras readily available in the West at that time. It is not known when this activity stopped; it obviously did not continue past 1941. ↑ The address was 303 West 42 Street, Dept. J7, New York, N.Y. 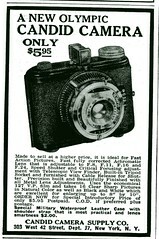 Source: advertisement in Popular Photography February 1938. McKeown, James M. and Joan C. McKeown's Price Guide to Antique and Classic Cameras, 12th Edition, 2005-2006. USA, Centennial Photo Service, 2004. ISBN 0-931838-40-1 (hardcover). ISBN 0-931838-41-X (softcover). P.176.